Derrick Henry, welcome to the 2018 NFL season. After struggling throughout the first 12 weeks of the NFL season, Titans RB Derrick Henry exploded in prime time on national tv. The Titans defeated the rival Jags on Thursday Night Football, 30-9. In the process, the Titans remain alive and well for the playoffs. However, nobody is going to be talking about that at the water cooler today. Today the story is all about #22, Derrick Henry. Best Run in NFL History? Derrick Henry scored on the longest (and perhaps most impressive) run in NFL history with shades of “Beast Mode,” Marshawn Lynch’s instant-classic run against the Saints in the playoffs several years back. Derrick Henry bulldozed, bullied, and stiff-armed his way down the entire field (literally) on his way to the NFL record tying run of 99 yards. Social media was set ablaze with amazement. 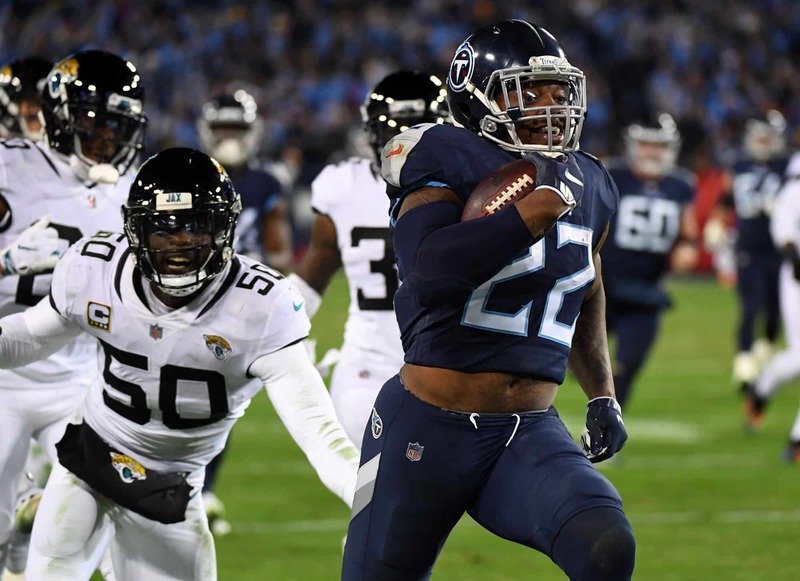 Derrick Henry, also known on Twitter and to Titans fans as “King Henry,” regained his crown in prime time in front of a national audience on Thursday Night Football. Henry rumbled for 238 yards on 17 rushes and 4 touchdowns. Honestly, Henry should’ve added a 5th touchdown but made a selfless act and pulled himself from the game inside the 5-yard line to allow fellow RB Dion Lewis a chance to score. It’s no secret that Derrick Henry had been struggling coming into Thursday’s game against the Jacksonville Jaguars. Coming into the season, Henry was gaining a lot of hype amongst the fantasy football community. The starting job for the Tennessee Titans seemed all but certain. After a slow start early, Henry was replaced in the starting lineup by Dion Lewis–a much smaller, shiftier running back. When Titans’ RB Derrick Henry scored on his 54 yard touchdown run last night – after his record-setting 99-yard TD run – he reached 21.74 mph, the fastest speed by a ball-carrier on a TD run this season, per Next Gen Stats. So why is Henry not producing, and playing, more? In this game alone, Derrick Henry added nearly 30% to his season-long yardage total as well as doubling his touchdowns (5 to 9). Derrick Henry increased his rushing yards per carry season-long average (YPC) by 1.3 YPC in a single game!. Coming into the 13th game of the season, Derrick Henry had fewer than 500 yards rushing. Now, he has 712 yards on the season and a realistic chance at a 1000-yard season with 3 games to go! With the blowout win, the Titans have improved their position to make it back to the playoffs again this season. There’s still a long road to climb with no margin of error. If the Titans can run-the-table and go 5-0 in December, I believe their 10-6 record will result in another trip to the playoffs. So far, the Titans are 2-0 for December. The Titans will be traveling next week to New York to take on the surprisingly hot 4-8 Giants, winners of 3 out of their last 4 games. Rookie LB Rashaan Evans is also showing vast improvement. To set up the 99-yard TD run of Derrick Henry, Evans provided the final stop on a goal line stand by the Titans defense. In the last month, the rookie LB has developed into a dominant force in the middle of the defense. He also added a half-sack later in the game. #Titans‘ Rashaan Evans earned the 2nd-lowest overall grade by a rookie LB in the PFF era (2006-Present) in Weeks 1-6. In Weeks 7-13, Evans earned the No. 7 overall grade (83.5) and No. 2 run-defense grade (90.4). This was by far the best game of the season for the much maligned offensive line of the Titans. After a tweak at halftime of the Jets game which sparked a comeback, there was a lot of talk about reworking the starting lineup. Head coach Mike Vrabel decided to stick with the original lineup and it paid off. The offensive line only allowed 1 sack and for the first time all season Henry was allowed to get into the second level of the defense before making contact. What Lies Ahead for the Titans? The night wasn’t perfect. QB Marcus Mariota threw an ugly interception and missed on a deep throw. However, Mariota had a pretty clean game for the most part. For perhaps the first time in two seasons, the Titans won a game without the QB being the major reason on offense for the win. He really didn’t have to do much with the running backs accounting for nearly 300 yards. The pass-catching weapons around Mariota didn’t provide much help. WR Corey Davis missed a perfect pass from Mariota in the end zone for a late touchdown. WR Taywan Taylor dropped a ball on a deep pass down the right side. It wasn’t a perfectly thrown ball but in the NFL, you expect your receivers to catch that pass. The Titans need to find a way to fix the special teams. Cameron Batson had one of the worst punt returns you’ll ever see in the NFL that resulted in a safety. Kicker Ryan Succop missed an extra-point. Just last week against the Jets, the Titans special teams unit put on a comedy show. The Titans shanked a punt, had a punt blocked, had an extra-point blocked, allowed a big kick-off return, and called for a fair catch with nobody within 15 yards. Eventually, the errors by the special teams will cost the Titans a game sooner rather than later.